China National Building Material Group (CNBM) was established as a state owned enterprise in 1984 with assets totalling around 40 billion USD in 2014 and 200,000 employees, upholding the philosophy of “Making Best Use of Resources to Serve Construction”. The core competencies are in the following business divisions: Cement, lightweight building materials, engineering services and glass/FRC. In 2014, CNBM entered into the Fortune Global 500 again, ranking the 267th place, according to “Fortune Magazine”. 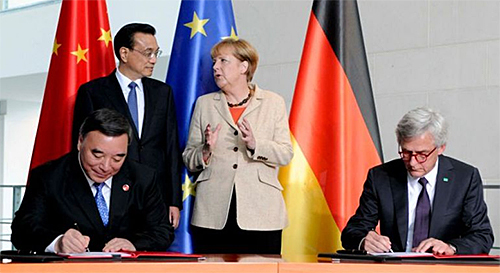 Song Zhiping, Chairman of the CNBM group signing a contract about sustainable construction with agn International in the presence of the Chinese Prime Minister Li Keqiang and the German Federal Chancellor Dr. Angela Merkel. In 2006, CNBM Group listed part of its activities under “CBNM Ltd” on the Hong Kong stock exchange (ISIN: CN000A0JDAF5, WKN: A0JDAF, Symbol: D1Y.FSE, Stock Code: 3323).